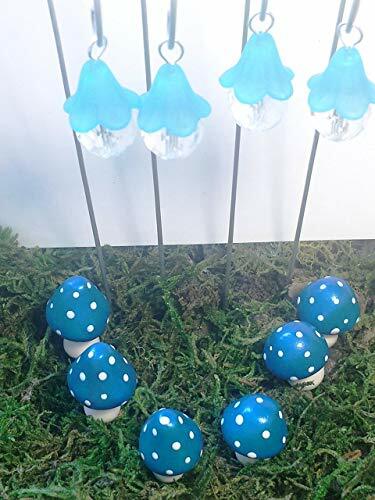 10 piece fairy garden set. 4 turquoise blue hanging lanterns made from blue flower beads and Czech fire polished glass beads. They hang from 7- 7 1/2 inch shepherd's hooks. The miniature mushrooms are colored with mica powders for a bright and vibrant pop of color. They measure between 1/2inch- 2 1/4 inches tall. Wire is inserted for easy positioning. The lanterns are made from beads, and therefor do not light up. If you have any questions about this product by Puppy Love Miniature, contact us by completing and submitting the form below. If you are looking for a specif part number, please include it with your message.